The internet has become very pervasive at shaping our e-commerce capabilities, the economic landscape and the rapid scalability of internet related jobs. This landscape that we interact with as marketers and consumers gets more complex everyday no matter which angle you come at it. Understanding trends to be able to navigate this environment is what helps us all stay afloat, at the very least. If you’re lucky you’ll have the time to experiment with emerging trends and insights and use the results to inform your marketing strategies. 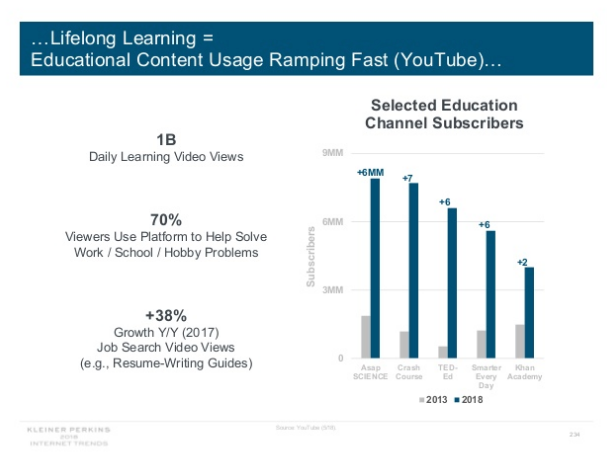 Mary Meeker’s yearly Internet Trends Report, published by KPCB, is one of the most highly anticipated and sought after trend reports of the modern age. Here are the top 6 2018 tech stats and trends distilled down from a hefty 294 slides. Although fewer purchases of new phones have been reported, mobile consumption is on the rise. In 2017, the total number of hours spent per day on mobile was 5.9. 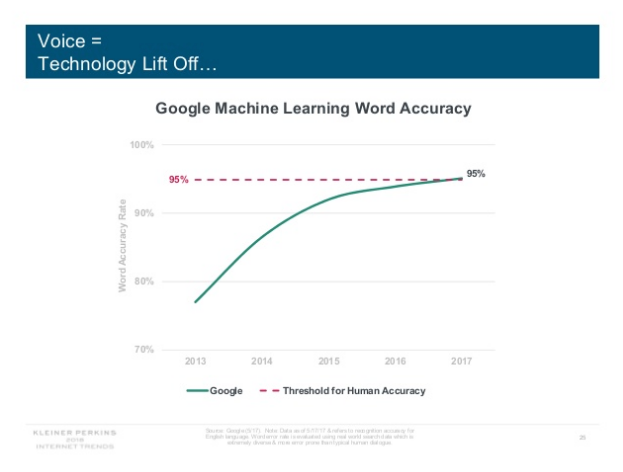 In terms of voice search, Google Machine Learning Word Accuracy is at an impressive 95% threshold. Expect to see the growing device adoption of voice enabled technology as the internet trend to watch in 2017. One slide in the report opened up with a statement that internet usage and growth has remained solid. Meeker backed the statistic, saying that usage is up 4 percent year over year. This is a great sign for online businesses continuing to invest in technology, content development, online advertising, and improving website speed. Everything from connected devices to Wi-Fi networks is getting faster, cheaper and easier to use. This level of accessibility contributes to the pervasiveness of internet usage and increases things like frequency of digital payments and online connectivity. At the center of this internet trend is the debate around how much (usage) is too much? Meeker and her colleagues say it depends on how the time is spent. 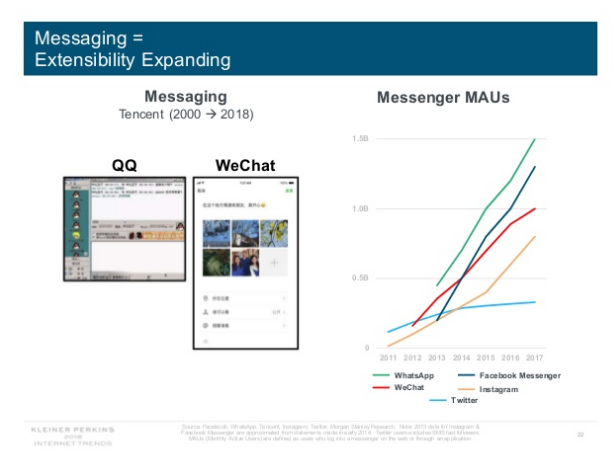 Their research showed messenger-enabled apps like WhatsApp, Facebook Messenger, Twitter and Instagram, are on the rise. 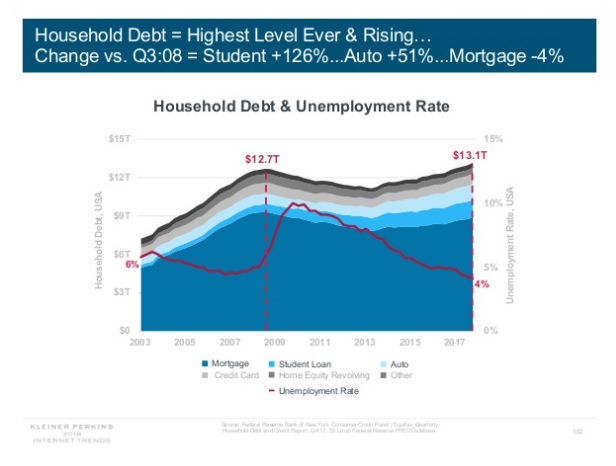 Unfortunately, household debt is at its highest level ever and continues to rise, with student loan debt a major contributing factor. Relative household spend is expected to increase over time in areas like shelter, pensions, insurance and health care. On the opposite side of the coin, prices on food, entertainment and apparel are dropping. 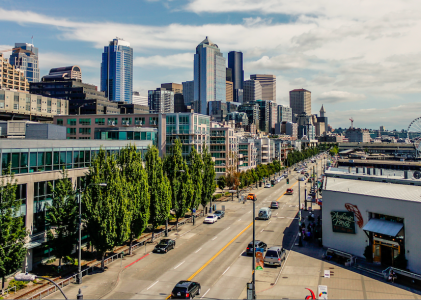 How, where and when people work is shaped by advancements in technology and access to internet. Over time, new technology will both create and displace jobs. This is unfortunate, but it’s also nothing new in terms of what we can expect from growth and innovation. 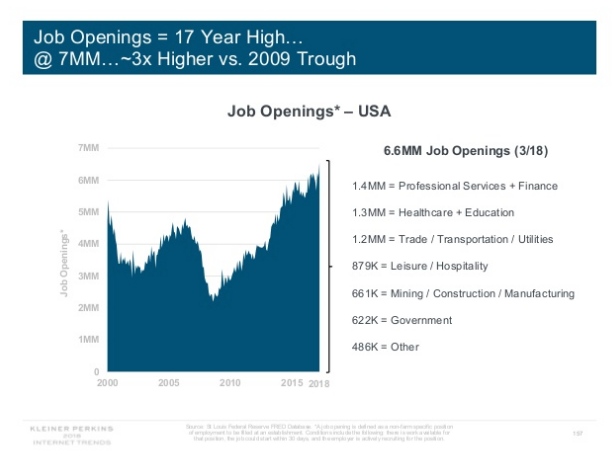 Interestingly, service jobs are on the rise, especially in professional services and finance. As Meeker explained, “Freelance work is growing three times faster than the growth of the total workforce.” The desire for greater work schedule flexibility and the ability to work from home are the most desired non-monetary benefits for workers. 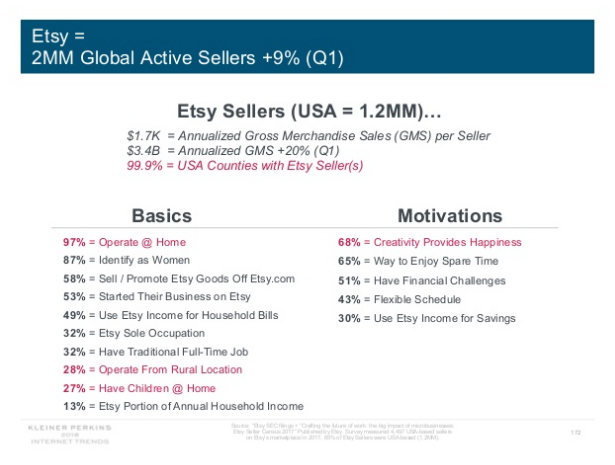 To put on-demand jobs into context, Etsy has two million sellers and Upwork has 16 million freelancers. The rise of on-demand, flexible jobs is a desirable internet trend for freelancers, as it fits their need for extra income and the ability to monetize under-utilized skills and assets (for example, your car). 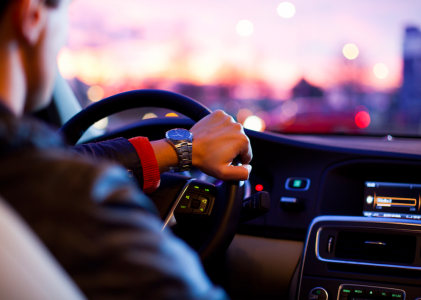 Bill Gurley describes Uber and the on-demand marketplace as a place where drivers aren’t told where or when to work, and where employee autonomy uniquely matches the supply and demand of the industry. This is a significant shift empowering internet-related jobs in the U.S. and other parts of the world. Clearly, this trend positions the internet as the source of employment, education and entertainment for years to come. The success formula (below) takes a page from business models pioneered by Slack, Dropbox and Zoom. Whereas Google set out to organize the world’s information and make it accessible, today apps are pioneering organizing business information and making it accessible and useful within enterprises. Meeker shared an example from Dropbox, showing how the benefits of using an online file organization system resulted in a 6% increase in the sales team’s productivity. 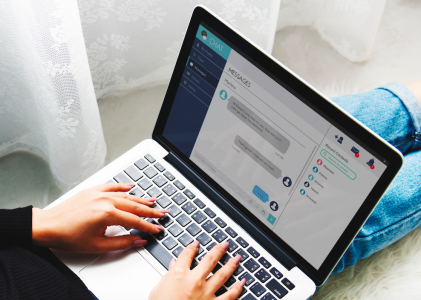 Future VC’s and founders take note: enterprise software engineered to be helpful and efficient will be a game changer for productivity and collaboration. Overall, Meeker sees that the internet is maturing and consumer indicators and online service providers are driving that growth. The biggest challenge now is a regulatory one – the need to ensure the integrity of the data being used to improve online experiences. Unprecedented change, opportunity and responsibility is the internet trend of today. All screenshots by Holly Miller. Taken June 2018 from recode.